The proponents of evolution and it's necessary brother, uniformitarianism, must concoct some pretty bizarre ideas, even geological processes, to explain the folded mountains and strata of the earth. Take a look at these mountains in British Columbia. They are severely folded like an accordion. This can only be because the mountain was soft sedimentary material when it was rapidly uplifted. Being soft and moist, the horizontal pressure of the continent squeezed the material so that it rose as a fully uplifted mountain before gravity could drain the water out of it and the material concrete into stone! Gravity would have no problem removing the majority of the water from this mountain in a matter of months, much less hundreds or even millions of years. Moreover, these folded strata are littered with fossils of rapidly buried creatures which are not distorted by or like the stone, meaning their bones are not bent like the strata, which verifies that the material had not concreted into stone before the strata were folded and the mountain was uplifted. You may also notice that the top of the mountain in the center of the image has had it's top sheared off. This is because while the mountain was still soft material being uplifted, it was under water at the time, and it's top encountered a high speed current of water near or at the surface of the ocean which ate away the top of the mountain - another feature of these mountains that could only happen if the mountain were soft sediments while it was being uplifted. In fact, the majority of mountains ﻿still have some or much loose sedimentary material upon them, which could not exist if the mountains were millions of years old. In only thousands, there should be no loose material on the top of any mountain, since the continents are eroding into the seas at a rate of 280 billion tons annually. To explain such mountains, and there are many, uniformitarianists must argue for absurdities. 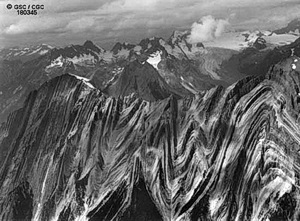 They must claim that the mountains were squeezed up out of the earth "fully formed" with folded strata in place. This means they must (if they stick to their own claims) believe that the stone was bend by pressure and heat of 300C (about 500F) or more and uplifted, fossils in place and all. I've even had evolutionists make this very claim to me during debate. This requires them to believe a number of things have occurred not only for which there is no evidence, but also which the evidence refutes. Consider: If the folding took place deep in the earth with fossils in place, the fossil bones would be bent like the stone, but they are not. I have yet to see a single fossil which has bones bent by heat and pressure. If any exist, they must be so rare that nobody bothers to discuss them. More absurd than this, the uniformitarian must believe that there is some mystical geological process which causes massive volumes of sedimentary strata to be pulled down into the earth to a depth where the temperature could be great enough for the stone to be folded without crumbling, then pushed up to become a mountain rising thousands of feet into the atmosphere. It does not take a genius to see the absurdity of believing this has taken place in all of the earth's mountain ranges. We do have areas which have been pushed down, and we have places where the continents have been pushed up. This is to be expected during the movement of the continents during the Noachian Flood. However, the idea that this material was "pushed" down to such depth and then up again is stretching the imagination to say the least. The best, and only logical explanation for folded mountains is that they were uplifted during the Noachian Flood while their material was still soft and malleable. The Noachian Flood is a geological certainty, evidenced in a great many ways. To believe ready-made mountains were pushed up out of the earth with folded strata and non-bent fossils is a fantasy that even uniformitarianists should scoff. I somehow believe they do scoff at themselves at times, but shrug their shoulders and satisfy their disbelief in their own ideas by simply saying to themselves, "Oh well. It happened anyway." The radius of curvature of mountain ranges such as in the picture are of the order of hundreds of meters. Therefore, any bending of individual fossilized bones would be essentially un-noticeable. Yes, but you need to look at the highly folded and convoluted strata also found in mountians, often near the base. Go do that so that you will see what you did not realize exists. 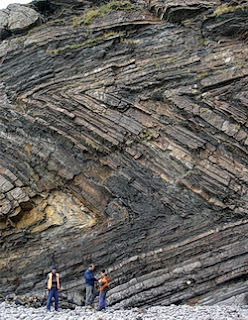 Just go to Google Images and type "folded strata" and begin the journey. Your shearing theory doesn't make much sense. Wouldn't a fold in soft moist earth naturally loose some of their peaks as they rise. The high velocity water such as is demonstrated in the Grand Canyon is more of an excavating force, rather than a peak shearing force. Dave, you left this same comment on my YouTube video. Please chose one or the other to make a given coomment. Furthermore, I provided you with helpfull information so that you could learnmore about the nature of folded strata, and how tightly folded they are in so many (millions) places. In a great many cases, strata are folded back upon themselves in a space less than one foot, or 3 ft. In these we often find fish or sea shell fossils, and they are NOT distorted by heat and pressure. Before repeating the same comment, shouldn't you have investigated these folded strata so that you could see that your prior statement about the large scale of folded strata in the image of the mountians in my video was based upon little if any knowledge of the matter? What would you say about a creationist that knew nothing about something an evolutionist discussed, and demonstrated that they were unwilling to investigate, but willing in ignorance to comment that the evolutionist is wrong, repeatedly? Shouldn't you take an intellectual approach to science and information instead of one based upon ignorance and emotion? Please upgrade yourself. Thanks. NephilimFree, I am glad to see somebody debunking and refuting the theory of Evolution. Keep striving for truth and trust in God. Thank you. Christ is my goal. "We do not expect to see previous forms outnumbering the newer forms at all, due to numerous reasons, for one populations don't grow indefinitely,"
Obviously you don't think about evolutionism beyond the surface. If evolution created all of the features and structural designs of life, each "fully-formed" creature would have had all of it's features arise in small increments, unless you believe in the Hopeful Monster Theory, which is of course absurd. Therefore, each species would be represented by a very great number of incremental changes to morphology. For all of the various types of life, this amount to billions times billions of forms - vastly more than the number of species that have ever existed and could be considered "fully-formed". Less than 1% of all the species known to have existed on the earth are not extinct. When we figure this in, the number of transitional forms that should exist increases far greater. Even Charles Darwin acknowledged that if his theory were true, transitional forms should exist in countless numbers, and he was perplexed that none were known. Nothing has changed. They are still not known. The absence of transitional forms has been admitted to be a serious and discomforting problem for evolution by many scientists who are evolutionists, from Darwin's day to the present. FACT #1 , Science has NEVER denied the flood of Noah , but it HAS proven that the flood was centered primarily in the middle east and involved rising waters caused by glacial ice flowing down the Mississippi river and melting quickly in the gulf of mexico and rapidly increased river levels in the middle east , to the point where the land area that contained the southern border of the black sea and resulted in the localized flooding. FACT #2 , The account of that flood was recorded by SEVERAL cultures and pre-dates The Biblical accounts by centuries. WHICH explains logically why and HOW the world population of Humans . animals and plants could reach current levels and genetic diversity in just a few thousand years., considering there is NO evidence that humans have ever been able to produce litters of multiple offspring like dogs, cats, mice , reptiles and fish and fish and such. And should I assume that you are among those who can somehow compress the history of ALL life on this planet from hundreds of millions of years , to just a few million years ? And that man and dinosaurs occupied the earth at the same time without the aid of M16s and RPGs to keep from being easy , convenient SNACKS for T-Rex and Velociraptors ? And PLEASE DONT pass creationism off as any type of true science.. Whenever legit science is CONTAMINATED by even 1 shred of either religion OR politics , its NO longer science , its crap , FLUSH IT ! As for that phrase in Genesis that says man is created in God's image , well in 61 years of life on this primitive planet , I have yet to meet or debate just one single " true believer " who hasn't completely convinced me of precisely the OPPOSITE of that ! "Science has NEVER denied the flood of Noah"
"...but it HAS proven that the flood was centered primarily in the middle east and involved"
Not hardly. The strata are global and deep, littered with countless rapidly-buried organisms and polystrate fossils, even coal seams passing through numerous strata claimed to have been laid down of hundreds of thousands of years (Impossible! There's a coal seam passing through them!). There is so much incorrect in what you have posted. It would take me an hour to debunk it all.